This week was special in France. Not because of Halloween, but because of La Toussaint which literally means All Saints Day. France being traditionally and historically a Catholic country, the French celebrate all the saints, known and unknown. In the Western Christian practice, the celebration begins on the evening of 31 October, All Hallows’ Eve (All Saints’ Eve), and ends at the close of 1 November. It is the day before All Souls’ Day, which commemorates the faithful departed. 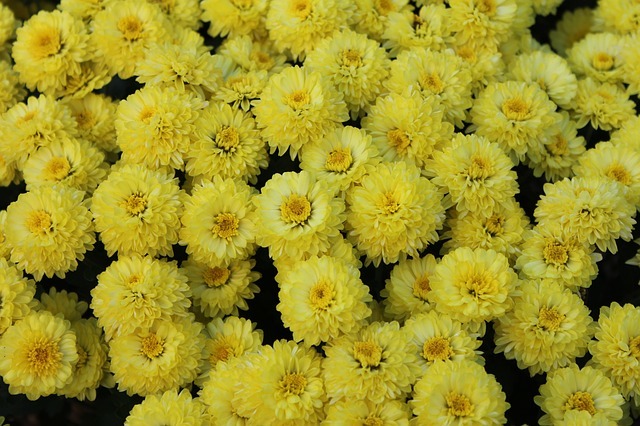 It is a bank holiday in France and I remember going to le cimetière, the cemetery with my grand-parents in Auvergne with a a bouquet of chrysanthèmes, chrysanthemums. Find out more about this celebration and the difference with Halloween in this great article by Agir en français aimed at French learners. You can even take the fun quiz at the end of the article about French celebrations! “Je suis dans la fleur d’un âge qui commence à sentir le chrysanthème.” Robert Lassus, journaliste et dessinateur français. This a play on word in French: “I am in the prime of life when it starts to smell Chrysanthemum”! 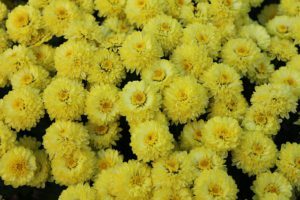 Read about this beautiful flower and why it is la fleur de la Toussaint in this interesting blog post written by Maria-José, a fantastic French teacher. Le cimetière du Père-Lachaise à Paris. Have you ever visited this famous cemetery in Paris? It is famous because many celebrities are buried there. Not only famous French people such as Edith Piaf but also international people such as Frédéric Chopin, Oscar Wilde or Jim Morrison! 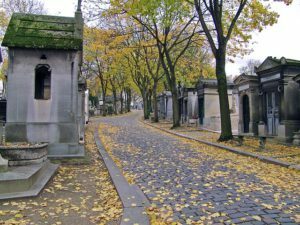 Watch a tour of the cemetery on Tout Paris en vidéo website. Une histoire qui fait un peu peur ! Although it not part of the French tradition, Halloween has become popular recently in France. To be honest, ce n’est pas ma tasse de thé, it is not my cup of tea! I don’t like spooky things and I don’t really see the point of dressing up as monsters or dead people! However, I did make an effort and my story this week is a little scary! It all started with my own son who never tidies up his clothes in his room and it ended up with un fantôme (watch my last one minute video to find out about this word)! In the comments below, let me know whether you are messy like Thomas? Est-ce que tu es désordonné comme Thomas ?